When you think like a child, anything and everything is possible, as the world is then full of countless possibilities and opportunities waiting to be explored within the confines of an imaginative mind. It is, hence, no wonder, that ‘thinking like a child’ is a concept introduced actively in the world of didactics and arts in order to facilitate the process of thinking beyond boundaries. With voices from authors, teachers, tech evangelists, storytellers, artists and children, ‘Jumpstart 2017’, organised by the German Book office, in partnership with Goethe Institut (Max Mueller Bhavan), facilitated better understanding of learning and innovation. This platform provided a new opportunity to participants to look at everything they saw, heard, learnt, wrote, drew and published with a ‘fresh pair of eyes’, and from different angles of observation and understanding. Besides this, the forum brought thinkers, creators, practitioners and publishers together, recognising that the school is a starting point for many creative journeys; however, learning has moved far beyond the four walls of the classroom, encouraging new tools and techniques. Subjects like the landscape of learning, new methods being explored to make learning more integrated with life experiences, positioning of children’s needs in didactic innovations, including aspects like game-based learning, dance in education, storytelling, amongst many others, were highlighted and discussed. One of the speakers was the illustrator and cartoonist from Hamburg, Moritz Stettler. He conducted the session Plug’n’Play: Storytelling for Learning Outcomes. Stetter’s first graphic novel Bonhoffer (2010, Guthersloher Verlag) is a biography of a well-known theologian in resistance during the Nazi regime. 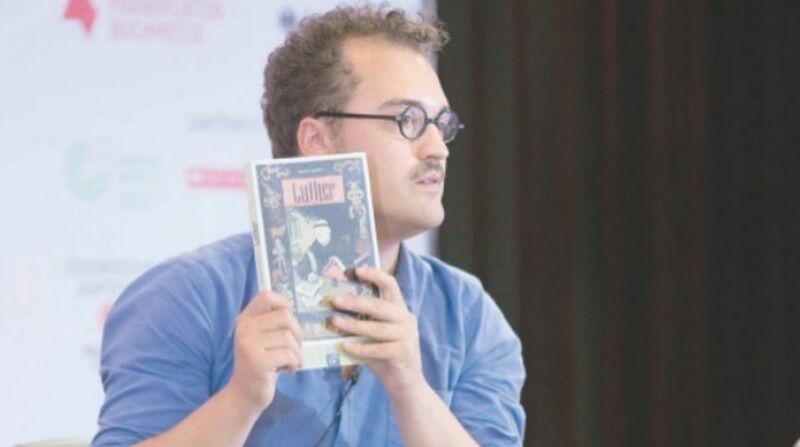 His second book Luther (2013, Guthersloher Verlag) deals with the life of the famous reformer, his strongest convictions and how he struggled with them every day. Stettler’s works have been showcased in numerous exhibitions, across the world, including Hamburg, Frankfurt and Lisbon. During the event, Stettler also organised a master class titled ‘Play the Palette’, which focussed on storified learning, wherein participants were guided to explore storytelling through a visual medium. The process bringing together storyboarding and the art of doodling facilitated better understanding of how stories are told and unfolded on paper without words. So, what was the inspiration behind this choice of profession? Stetter puts it simply, “I can’t imagine myself doing anything else.” When questioned about which medium scores ~ visual or verbal ~ he maintains that both media are equally important, as they have their own strengths. However, if these media are combined, the result is a ‘hybrid’ media: comics, powerful as far as the communication and creative aspects are concerned. His experience of India, and in India, encompass many feelings, especially as this trip is his first to the country: heart-warming, overwhelming, shocking, exciting, scary, lovely, indescribable…the list goes on. Any message for the youngsters planning to enter the field of illustration? “You should really have the desire and commitment to tell a story. Fame and money are all secondary. Primary objective is to enable people to go through a range of emotions during the storytelling process. If that is your objective, then you are on the right path. The challenge of finding a balance between the materialistic and the artistic world will always be paramount, but the will to overcome this challenge is what is matters,” concludes Stettler with a smile.